I have often likened a truck driving career to being self employed. I believe they are extremely similar, and I can say that with some degree of conviction. As a long time business owner before jumping into this business as a second career, I have found the similarities to be striking. My background of entrepreneurship has served me well when learning how to succeed as a truck driver. The principles of success that one needs to apply in trucking are very much akin to those that a small business owner must embrace. If we take a look at the methods that a person practices and the sacrifices they make for success in their business, we will also find the secrets of success at truck driving. I have a creative nature about myself. I like to create things. I write music. I write poetry. Heck, I like to write articles for Trucking Truth. I enjoy coming up with ideas and then producing them. I was in the sign business for many years. I loved the whole process of it all. I enjoyed going out and selling an idea to someone. Then I would enjoy drawing it all up, designing it, fabricating it, and even installing it. I was very much a hands on manager because I was passionate about the whole process. From start to finish, I wanted it to be just what my customer wanted. I did some very large projects and worked for some nationwide companies. I had some great employees, but I still liked being involved in the whole process. You were just as likely to find me in a suit talking to a banker as you were to find me in some coveralls out on the floor of the shop putting the final touches on a welding project. It all fascinated me, and I was passionate about getting it right. Have you noticed how many of the truck driving failures you will find online who seem to hate what they are doing? Those of us who are passionate about this career are quietly enjoying ourselves out here and making good solid money doing it. We don't get online and slam every company that we have worked for. In fact most of us have only worked for a small number of companies. Most of your successful truck drivers who are passionate about their career absolutely do not job hop all around to different companies. They've found the key to success and it had nothing to do with who they were working for, but rather how they conducted themselves out here on the road. I often had to wear my salesman hat. I think this is important, so hear me out. Have you ever thought about how a truck driver is like a salesman? Who is it he is selling to, and what is he selling? If you hadn't considered this concept then you may not understand an important aspect of the job. 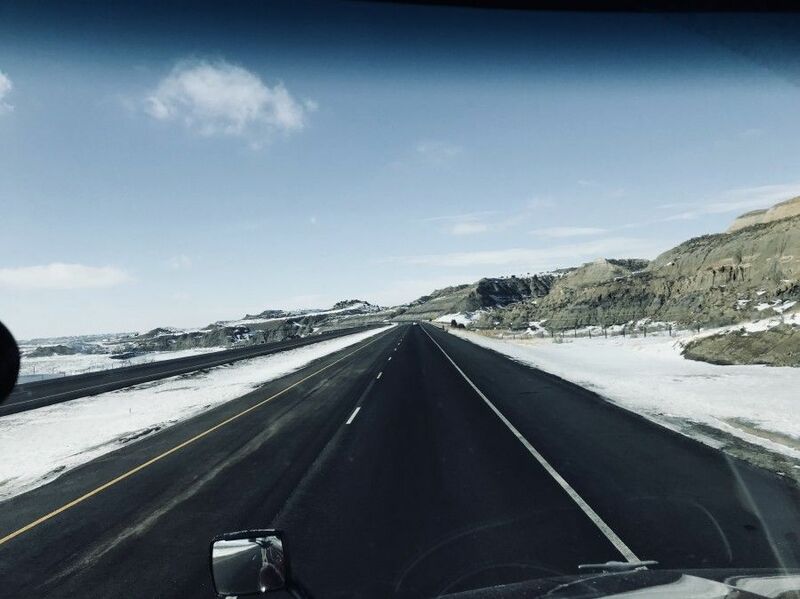 It's one of the key components that separate the true professional drivers from the mediocre guys who never seem to lay hold of success in trucking. Most of your average truck drivers think of their dispatcher as their boss. Not me! That dispatcher is my customer. That is a critical distinction. I am constantly selling myself to that customer. In business you soon realize that your customers are your lifeline. They provide you with work. They provide you with cash flow. They are what keeps you afloat. They are your most important relationship when it comes to your success. If they are unhappy with the way you are performing, they will look elsewhere to get the things they need. When they are happy with what they are getting they will always be there for you. How do you keep a customer happy? By always taking care of the things they need you to do, and if you can exceed their expectations in the process, then you are really securing their favor and loyalty. Your relationship with your dispatcher is vitally important to your success. If you can think of them as someone you want to serve well, you will have success. They are not here to serve you, but you are here to serve them. If you can do that, you will reap the rewards. We sometimes use the phrase "lobbying for miles." We are talking about selling yourself to your dispatcher. You can't lobby for miles if you don't have a track record that shows you are capable of getting things done. If you are continually a problem for your dispatcher, then it is extremely hard to try to sell them on the idea of utilizing you more effectively. You have sunk down into that realm of thinking of them as a boss, and now you are unhappy with your stinking boss who doesn't care whether you are successful or not. You have begun to think of them as demanding and inconsiderate. As soon as you have set yourself into that mode of thinking you have destroyed your ability to sell yourself to them. It is absolutely critical to your success that you don't let that happen. A professional truck driver has got to be like a self employed business owner who understands that his customer is his livelihood, and therefore he makes sure that he is keeping that customer satisfied. Your dispatcher is your number one customer. Treat them that way and you will never be short of work in this business. I often had to wear my hard-hat. That means there are times I have to do whatever it takes to get the job done safely. In business you have got to get your hands dirty sometimes and make things happen. It is the same way out here on the road. We deal with a lot of issues out here and it isn't always cut and dry on how you get things done. There are times I've bent a few rules out here because it meant I could make sure things went the way we had planned. I'm not talking about breaking laws and being an outlaw. I'm really talking about being creative with my solutions and my problem solving methods. For instance, I keep some of our customer's fork lift operator's phone numbers in my phone. If I get in a bind and can't get there on time, but absolutely need to get unloaded that day, I will sometimes make arrangements for them to stay late and unload me. I have also parked my truck in some creative places just to position myself so that I can get in and out before the other drivers that are going to show up. Sometimes you have to get down in the dirt and make sure things go the way you need them to. It's this type of determination that separates a professional who can always be counted on from your average driver. It is just this type of attitude and drive that I learned as a small business owner that has translated into great success out here as a professional truck driver. When I was in business it was not unusual for me to work all night while my employees were at home asleep in their nice warm beds. I might take a little nap on a metal table in the shop with a roll of paper towels as my pillow and then get back to work after just a brief repose. If I had a project that my customer was needing finished, I would go all out to make it happen. That track record of getting things done was all I had to stand on. It became the foundation of my success, and it gave weight to my efforts at securing more business. It is this same approach to truck driving that will designate you as one of the ones who works his way to the top of the food chain. If you have a track record of making things happen, then you will be called on and counted on as a regular point man for the team. Have you ever had a bad tooth? You know, the ones that make you try to avoid eating on that side of your mouth because you just never know when that thing will all of a sudden give you a shooting pain? Many truck drivers are kind of like a bad tooth for their dispatcher. Their dispatcher never knows when that driver is going to give them a sudden shot of pain. Therefore they kind of avoid using that driver as effectively as they do the better drivers that they know will make the necessary sacrifices to get the job done. You don't want to be the driver that is getting passed up on the really nice loads just because they never know whether you are going to get it right or not. If your past performance has cast some doubt in your dispatcher's mind so that he never knows when you are going to give him an unexpected jolt of pain, then you will suffer the consequences of being just an average driver. As a small business owner I wanted to increase my income. After all, I was the one who was committed to making it work. I was the one wearing all the different hats. I was the one making all the sacrifices that I thought necessary for success. I never measured my income by how much time I spent at the job, goodness that might have been embarrassing if I were to analyze it like that! I used good accounting methods, and I looked at our progress on a regular basis. The most important time of the year when analyzing the numbers for me was at the end of the year. I wanted to see what my total profit margins were for each year. Those numbers were important to me. They gave me an idea of how we were doing and what we needed to do to improve our income. We might have a bad month here and there, but I wanted to see the overall outlook at the end of the year. I wanted to make sure that we were profitable, because if we weren't then we needed to make some necessary changes so that we could be. So, how do these comparisons affect you as a truck driver? I have noticed a great disparity in truck driver pay. The great differences don't manifest themselves in the rate of pay, but rather in the end results that drivers get. You'll even see a large disparity sometimes between drivers working at the same company. At the end of the year I want to be making the kind of money that I think is a reasonable reward for the efforts I put in during the year. I think everybody feels this way. The disparity happens because some of us were not as successful as we should have been with our efforts during the year. Truck driver pay is merit based. That just means that you get what you deserve in this business. We often call it performance based pay. We have to do whatever it takes to get ourselves to the top in this career. You can take an average driver and pay him 45 cents per mile, while at the same time paying a Top Tier Driver that same 45 cents per mile. The Top Tier Driver will come out way ahead of the average guy in the end because he's going to turn a lot more miles. 1) Average drivers get average results. They have not developed a track record of consistent performance that cause their dispatchers to depend on them heavily. 2) Top Tier drivers are leaned upon heavily by their dispatchers, and average a surprising amount of miles over a year's time. A driver who averages 2,100 miles a week at 45 cents per mile will gross $49,140. A driver averaging 3,200 miles a week at that same rate of pay will gross $74,880. Which driver would you like to be? The power of choice lies in your hands. An accurate record of everything being shipped on a truck, often times used as a checklist during unloading. Many folks come into truck driving believing they should be treated like gold without having to prove themselves first. That's simply not how it works. What Should I Expect To Learn From My Trainer? I went through a lot of difficulties at the start of my trucking career. I hope to show you can still succeed and enjoy this career even after a rough start.